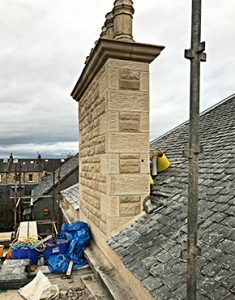 J D Smith Stonemasons Ltd was established in 1975 with the chief goal of providing a full stonemasonry service to preserve Edinburgh’s beautiful historical appearance. We are a fully public liability insured company with 35 years of stonemasonry experience. We only work with Local Council approved contractors, undertake insurance work if required and are members of The Federation of Master Builders and Constructionline. To date, we have undertaken a variety of projects, ranging from full building stonemasonry services to the general public, private sector and local councils to complex ones such as bridges and entire structures. Throughout our three-generation family business history, we have made generous contributions to the stonemasonry field and have expertise in a wide range of walling, from dry stone and ashlar block to coursed rubble and square walling. Our accredited [insert accreditation] stonemasons are masters in their craft – we offer a full building service from project planning to completion. We operate as an independent stone masonry business and employ locally trained stonemasons and craftsmen. Even in today’s day and age, stone is regarded as the common denominator in the architectural world – after all, it is highly sustainable and boasts strong qualities which make it ideal for preserving Edinburgh’s historic architectural buildings and structures. The hard-working stonemasons in our ranks are more than just men of skill and passion – for their work revolves around a complete culture, and not just a trade or craft. This passion and dynamism translates all across the board – it is this penchant for perfection and unparalleled craftsmanship that binds us. Even though we have access to modern stonemasonry and craftsmanship technology, we do not underestimate traditional methods – computers can to a certain extent aid us in designing and engineering a piece, but the life force behind those computers are gifted stonemasons and craftsmen who have an uncanny eye for detail. Our skilled stonemasons provide a complete range of stone repair, conservation and natural stone construction services which include stone lettering and carvings, stonework on bridges, buildings and other large structures, chimneys, garden and rubble walls, lithomex repairs, stone cleaning and traditional lime pointing. We bring over 35 years of specialist stonemasonry experience to you and frankly speaking, once you take advantage of our wide and diverse range of stonemasonry and restoration services, you need not look any further. No matter where your interest lies – using natural stone to bring a building to life, new masonry installation while renovating your home, perhaps a fireplace or conversation of historic buildings – we are only a phone call away. Get in touch with us to discuss your project. We look forward to offering you a high quality stonemasonry service. Copyright@2017 . All Rights Reserved.